This buffalo ranch chicken dip is a quick and easy appetizer that’s loaded with shredded chicken, ranch and plenty of cheese. 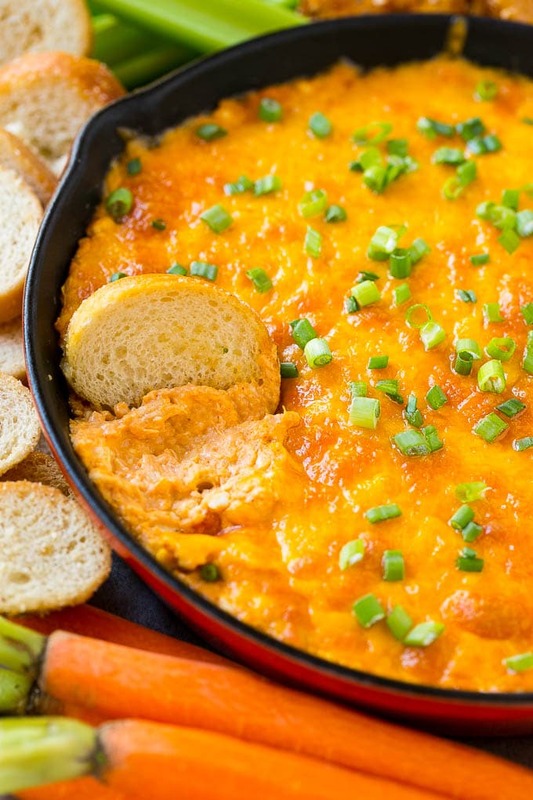 It’s a make-ahead dip that’s perfect for game day, parties and more! Chicken, cream cheese and buffalo sauce all come together to make the most delicious creamy buffalo chicken dip. Serve it with toasted bread, pretzels and veggies for a crowd pleasing snack that’s great for any gathering! It’s almost that time again – time for the big game! Watching the game has become a father-daughter tradition in my house. The girls spend quality time with their dad and I keep the snacks coming, because football food is as fun as the actual game itself. 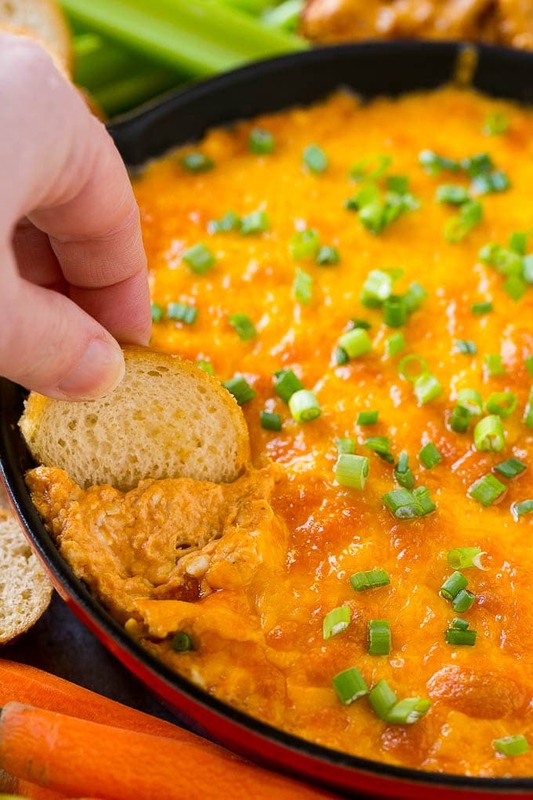 This easy buffalo ranch chicken dip is one of our favorite snacks for game day, and it also happens to be super easy to make. 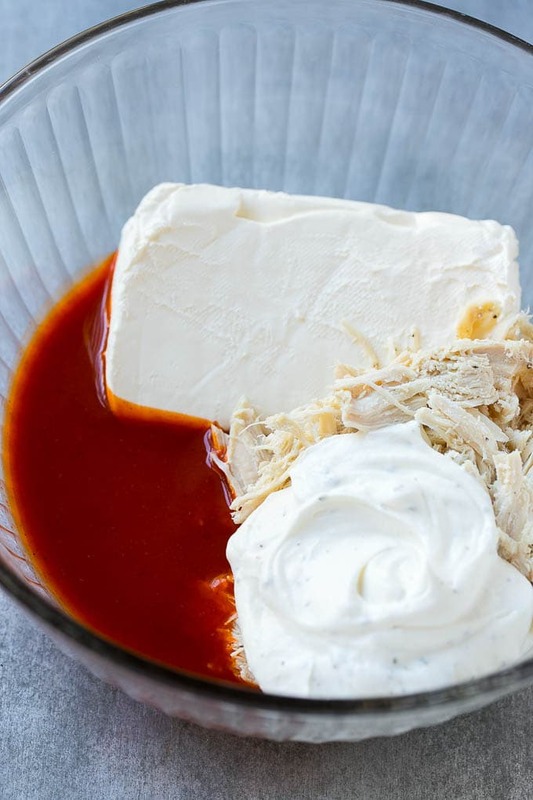 For this buffalo chicken dip, you’ll need cooked shredded chicken, cream cheese, buffalo wing sauce, sour cream and ranch seasoning. All of these ingredients get mixed together to form the base of the dip. You can use any type of cooked chicken that you like, rotisserie chicken is always a super convenient choice. It’s important that your cream cheese is softened so that all the ingredients blend together nicely. The buffalo chicken mixture gets spread into a skillet or pie plate. 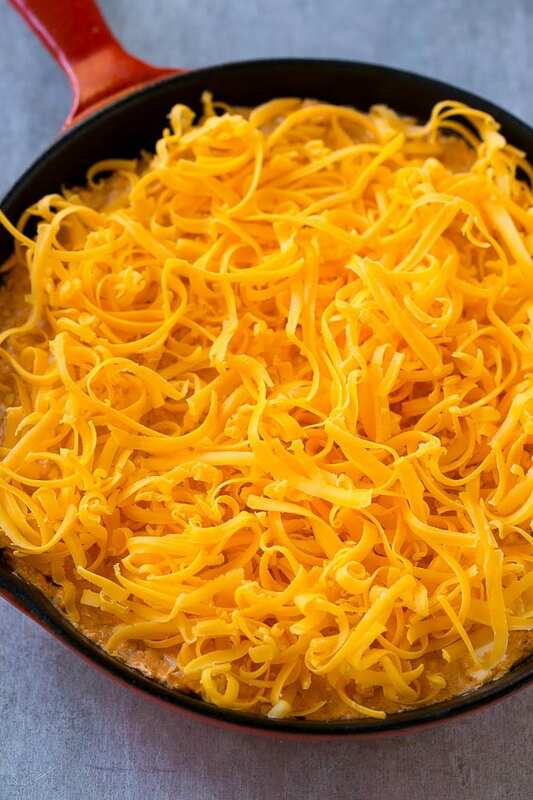 The final step before this dip hits the oven is a layer of shredded cheese. I like to use cheddar cheese, but Monterey Jack or mozzarella cheese would also work nicely. 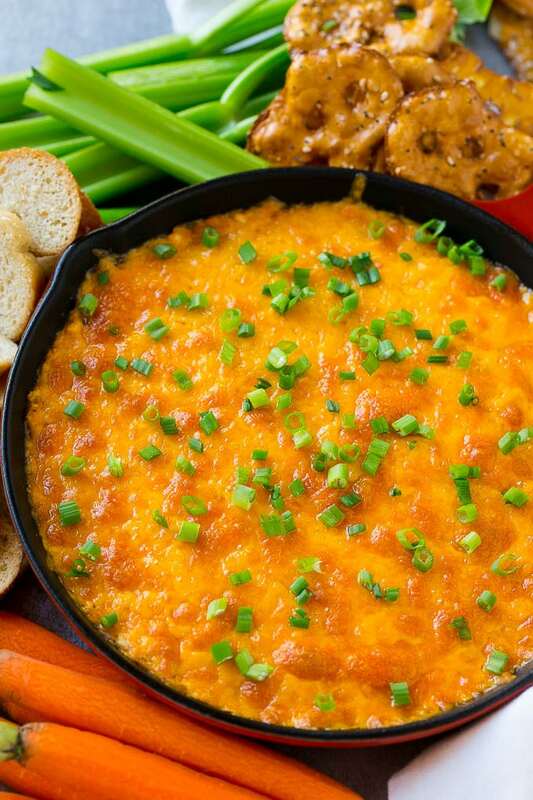 The buffalo ranch chicken dip is baked until browned and bubbly, then topped with green onions and served with a variety of dippers. I like to serve this dip with carrots, celery, pretzel thins and toasted baguette slices. You can buy pre-made toasted baguette slices, also known as crostini, in your grocery store’s bakery or deli departments. All you need to do from here is serve and enjoy! 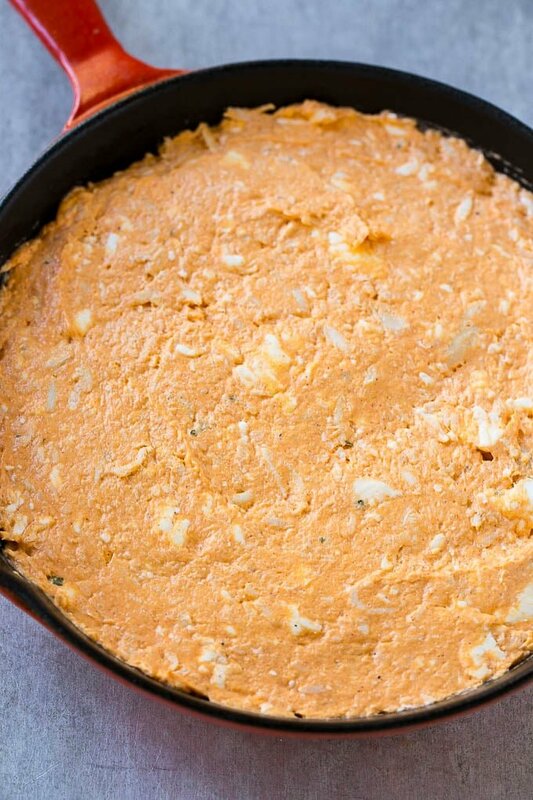 This dip has all the great flavors of buffalo chicken in an easier to eat form. You can prepare this dip in advance and store it covered in the fridge for up to one day before you plan to bake and serve it. This dip is always on our table for parties, and I hope your family loves it too! 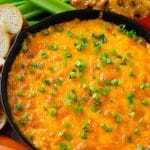 A creamy and spicy buffalo ranch chicken dip that's easy to make and a real crowd pleaser! In a medium bowl, mix together the chicken, cream cheese, buffalo wing sauce, dry ranch mix and sour cream. Coat an 8 inch skillet or pie plate with cooking spray. Spread the chicken mixture into the skillet. Bake for 20 minutes or until browned and cheese is melted. Sprinkle with green onions and serve. Serve with baguette slices (crostini), pretzel chips, breadsticks and veggies. Rotisserie chicken works perfect here, but any cooked or leftover chicken will also work. This post was originally published on January 6, 2016 and was updated on February 1, 2018 with new content. Yummy! I’m a chicken lover and dips make it even better. This is a good fusion of flavors blended together.